Aesthetically beautiful and eco-friendly polished concrete flooring is an ideal solution for commercial floors. The glossy surface resists the marks of forklift truck tyres; and maintaining the shine requires only minimal effort. The benefits in the working environment are even greater for the employees: it’s natural, dust-free and hypo-allergenic. The reflectivity properties give the project a bright, clean and professional image. 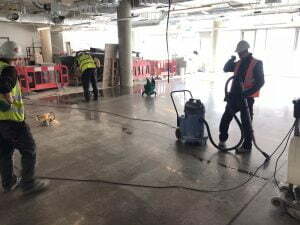 Polished concrete flooring is being used in a variety of different settings around Ireland: some of our recent projects in this area include Facebook’s new office in East Point, Zendesk on Charlemont Quay, The National Sports Stadium and the Aparto Student accommodation at Dorset Point. Considering the unprecedented growth polished concrete has experienced in Ireland, we explore the reasons why polished concrete is definitely not just a trend, but a concrete option for companies. Why is polished concrete becoming so popular in Ireland? Undoubtable the main reason Polished Concrete is so popular is because of its aesthetics. The reflectivity of polished concrete surface naturally brightens the area. As the floor reflects the artificial lights inside the building it not only shows a bright and lively area, but also reduces the need for additional electricity. Costs savings are unquestionably another great reason, the significant reduction in annual maintenance is another key factor to take into consideration when designing commercial space. 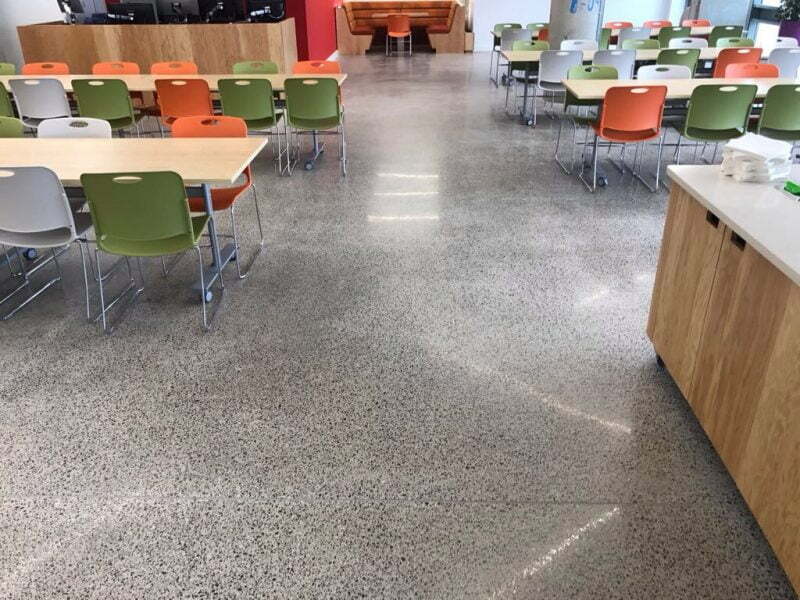 Cost-reduction benefits of polished concrete reduces not only the amount of time but also money spent on floor maintenance. An added bonus is no grout joints or gaps between timber borads, which means no magnetizing traps for dirt and dust. Once concrete is polished it increases the durability and strength of the floor. A polished concrete floor will last as long as your building The hardening process creates a skin on the floor, with a life cycle cost of up to 60% less than any traditional floor covering. Upon instalment and polishing, no dangerous synthetic components or any other precarious elements are used. Consequently, as soon as the floor is polished the floors can be used immediately and business can open as usual. Of course, floors need to be protected if works are still to be carried out in the area and we would recommend the polishing element is one of the last tasks to be carried out on site. Sustainable flooring solution, concrete polishing uses materials already present in the building. This is another advantage for companies embracing concrete polishing. Concrete’s durability is truly unbeatable when it comes to floor surfaces. Concrete polishing promotes a clean and professional image in any environment. The clean industrial look is a popular trend not only for commercial but also residential floors. The minimalist design gives a clean and simple look to companies and homeowners. Polished concrete floors have the same slip resistance as polished marble, granite, or porcelain. To give them a R10 slip resistance rating, they will need to be treated with special slip resistant coating. Despite its shiny appearance, polished concrete is highly slip resistant in dry conditions. Concrete polishing can achieve various design elements. 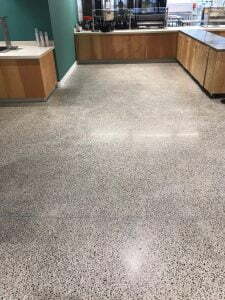 Polished concrete can range from a paste polish with a uniform colour and aggregate exposed to all the way to a deep polish where larger aggregates are exposed, giving a similar appearance to a Terrazzo floor. What will determine the colour of the floor is the mix in the concrete. The concrete supplier can add a lighter or a different colour sand to your mix in order to change the colour. It may vary from the most popular colour: grey to a natural sandier colour. Concrete can’t be transported far way; therefore, geography also determines the colour of the floor. The four main finishes are Bronze, Silver, Gold and Platinum. We have a blog post explaining each finish and all variation in colours and how to achieve different finishes. The majority of our clients opt for a simple finish based on their preference of sheen and aggregate exposure. Definitely, the ability to manipulate plain grey surfaces and transform them into shinning, easy to clean, environmentally-friendly, durable and stylish is one of our specialities. Learning how to read concrete is an art that comes with experience. The years of being on the floor behind the machines with a wise team avoids surprises on the job. The uniqueness of the concrete is that every floor is different and the concrete you start with will impact on the finish. In order to achieve better results and reach all the benefits of polishing concrete, we have invested heavily in our team. They all have extensive knowledge and experience working with concrete. Our specialist, Derek Mullen, has been working with us for 3 years now and he came on board with over 15 years’ experience in the construction industry, specialising in stone. He lectures on CPDs for architects and builders about polishing concrete and all the specifications involved in the process. Derek affirms that having the right equipment and knowledge is the key. It’s also very important to manage your client’s expectation and ensure your team take great pride in their work. 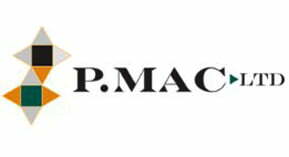 P Mac restores a piece of Dublin history with Bewley’s Café PMAC restore Dublin bridges in partnership with Dublin City Council.